There are quite a few non-amplified and amplified stethoscopes available on the market these days. Unfortunately, it is difficult to make comparisons between and among them, primarily because the manufacturers themselves are often unwilling to provide information about the frequency response of their products and there are no standards regarding the measurement of these devices. Secondly, a wide selection of amplified stethoscopes is not likely to line the shelves at the local University bookstore or the medical supply store. This sobering fact makes it difficult for you to “test” each product before purchasing. Finally, when health professionals with hearing loss approach audiologists for assistance, the audiologist may neither have adequate technical understanding of stethoscopes nor possess the proper instrumentation required to obtain measurements. Amplified stethoscopes are thought to fall into the category of an assistive listening device (ALD) for healthcare workers with hearing loss, and they are often (though not always) connected in some fashion to the user’s hearing aid(s) or implant device(s) for better reception. The purpose of this short review, therefore, is to provide you with some technical information about stethoscopes. The approach in this article will be to address five questions related to stethoscopes for health professionals with hearing loss. 1. What Can I Hear? The human frequency range of hearing goes from 20 to 20,000 Hz. However, hearing sensitivity is poor at both extremes (very low and very high frequencies) and best in the middle frequency range. This unequal hearing sensitivity across frequencies can easily be appreciated in Figure 1 where the human frequency hearing range is plotted with a stippled line on a graph (i.e., Hearing Sensitivity Curve). When we have our hearing examined by an audiologist, the frequency range is restricted from 250 to 8000 Hz, because sensitivity to speech sounds is the primary interest. Additionally, when hearing aids are tested, either in a hearing aid test box or in the sound booth while the user is wearing them, the frequency range is again restricted. Because most auscultation sounds are below 1000 Hz, there is a “Region of Uncertainty” for what a person can truly hear or what a hearing aid can amplify below about 200 Hz. It is almost as if the person, hearing aid user, or the audiologist is blindfolded from knowing what can and cannot be heard. The “Region of Uncertainty” is also shown in Figure 1 along with an example audiogram of a person with sloping, severe sensorineural hearing loss not using a hearing aid (other assistive device). You may not be accustomed to seeing the graph upside-down, but in such a graph, lower decibel (dB) numbers mean SOFT sounds and higher dB numbers mean LOUD sounds. There is a conversion process to plot the audiogram (in dB HL) to a physical measure of sound (in dB SPL). All graphs in this article are represented in dB SPL. As you look at the graph, sounds are considered audible when they are above the Hearing Sensitivity Curve. Similarly, when someone has hearing loss (red circles), sounds are considered audible when they are above the red circles. 2. 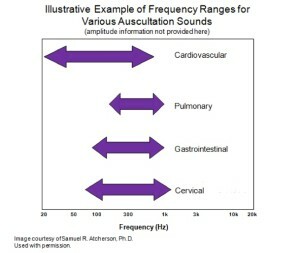 What is the Frequency Range of Common Auscultation Sounds? Sounds produced internally within the body are commonly evaluated using a stethoscope (called auscultation). There are four general categories under which body sounds fall: cardiovascular (heart), pulmonary (breathing), gastrointestinal (bowel), and cervical (swallowing). Each category has a different frequency range (Figure 2). Notice how cardiovascular sounds have the widest range, extending down to about 20 Hz. The remaining three, however, have considerable overlap. What is not depicted in this graph is information about how loud each of these sounds are. Undoubtedly, they will vary widely between categories, but also have large variability within categories. Thus, health professionals must be trained to listen, not only within certain frequency ranges, but also to listen for certain patterns reflected by amplitude changes. 3. How Are Conventional and Amplified Stethoscopes Different for Someone With Normal Hearing? Health professionals with normal hearing, or even people with primarily high-frequency hearing loss, can get by with conventional (acoustic-based) stethoscopes. The inherent properties of the diaphragm and bell, along with the tube length/diameter, and input to two ears, make it possible to achieve some natural amplification above the Hearing Sensitivity Curve. Figure 3 shows in the yellow region the amplification region offered by a conventional stethoscope. If an amplified stethoscope (electronic and/or digital), there may be a boost of amplification above and beyond the standard parts of the stethoscope. Thus, the amplified stethoscope acts like a hearing aid. The amplified stethoscope can help health professionals with normal hearing when they work in loud or busy environments. Also shown in Figure 3 is the amplification range offered by an amplified stethoscope. As can be seen, there is a noticeable increase in gain offered by the amplified stethoscope compared to the conventional stethoscope. 4. I Use Hearing Aids. What Can I Expect If I Use An Amplified Stethoscope? If you are a hearing aid user and will be expected to use a stethoscope, there are a number of different options available for you to try. There is simply no “one-size-fits-all” approach. Everyone has a different configuration and severity of hearing loss, and different sets of hearing aids. The most frustrated health professionals with hearing loss are the ones who could use a conventional stethoscope in the normal fashion, but depends on their hearing aids to communication with their patients. In this situation, the health professional could choose to take the hearing aids out to auscultate, and then put the hearing aids back in to communicate. Alternatively, this health professional could modify the stethoscope so that it is acoustically connected the a sound bore in the earmolds (see Applebaum, 2003). Both approaches work, but they may be considered awkward, unsanitary, or unmanageable by some. In other situations, the health professional has no choice but to depend on his or her hearing aids at all times. Other solutions are available to use an electronic or digital stethoscope such as cleverly using one’s FM, telecoil, or bluetooth system, or direct-audio input (DAI) coupling, to name a few. These solutions are described elsewhere in the Stethoscope section of the AMPHL website, or in one or more stethoscope article references. Things to keep in mind are compatibility issues of various electronic components and cables. It is recommended that you work with your audiologist to optimize the setup. The audiologist may need to consult with the hearing aid manufacturer, stethoscope manufacturer, or both, to get critical information. Implantable bone-conduction devices are not like cochlear implants; thus, they will be treated in the same manner as hearing aids for stethoscope use and setup. In the meantime, Figure 4 illustrates an example of what could be achieved with an amplified stethoscope through one’s hearing aids. Again the audiogram is displayed as if the person were not wearing a hearing aid. The blue-shaded region indicates the gain that might be provided by the hearing aid and amplified stethoscope together. While Figure 4 is ideal, recall that there will always be the “Region of Uncertainty” below about 200 Hz (see Figure 1). The hearing aid manufacturer may be able to offer information about how low in frequency sounds can be amplified. 5. I Use a Cochlear Implant. What Can I Expect If I Use An Amplified Stethoscope? If you are cochlear implant user, your hearing sensitivity is likely very good. It is not uncommon for cochlear implant listeners to achieve audiogram thresholds (indicated by a ‘C’) around 20 dB HL across the audiometric frequency range (see Figure 5). However, cochlear implant users still are not going to be able to use conventional stethoscopes because the sound must be delivered to the cochlear implant processor. Health professionals who use cochlear implants will likely be able to deliver sounds from an amplified (or electronic) stethoscope directly to their cochlear implant using a patch cord and their direct-audio input (DAI) port. They may even get creative and use their FM, telecoil, or bluetooth systems to provide a more wireless option, but the same delivery principles still apply. The fundamental problem today is that many cochlear implants have a low frequency cutoff that may make it impossible to hear cardiovascular sounds. That is, some cochlear implants do not go below 200 Hz, while others may be able to go down to about 75 Hz. The problem is generally not one’s cochlear implant programming (although it may be). Rather, the problem is due to one of several components (hardware or software) for the cochlear implant system. There may even be differences between the three major cochlear implant manufacturers (Cochlear, Advanced Bionics, and Med-El). As with hearing aids, it is strongly encouraged that the health professional with cochlear implant consult with their cochlear implant audiologist to optimize this setup. The audiologist may need to consult with the hearing aid manufacturer, stethoscope manufacturer, or both, to get critical information. Note: This extremely useful article first appeared on the AMPHL website in 2010 and has been unchanged from its original format. Samuel R. Atcherson, Ph.D. is assistant professor of audiology, teacher, lecture, researcher, author, and bone fide clinical audiologist with hearing loss at the University of Arkansas at Little Rock/ University of Arkansas for Medical Sciences. He is Professional Leader of Audiology and Past President for the Association of Medical Professionals with Hearing Losses. Atcherson, S.R. (2010). Technical Considerations in Using Stethoscopes with Hearing Aids and Cochlear Implants. Association of Medical Professions with Hearing Losses.